One of the joys of parenthood would be the picture perfect scenario of tucking in your little children into their respective beds, giving a butterfly kiss along the way, as well as bidding them good night and a pleasant time of recuperating from the day’s exertions. Of course, some of the little ones do happen to have a phobia of the dark, which is why a bedside lamp would definitely go a long way. 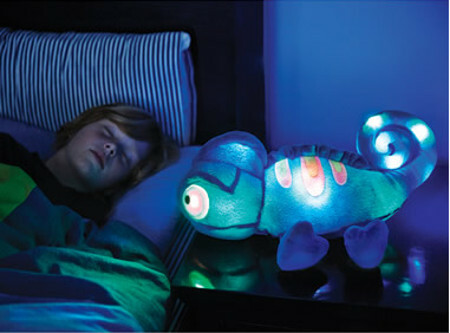 Rather than settling on something that is rather ordinary, how about going for a design that will certainly appeal to children in the form of the $39.95 Glowing Plush Bedtime Chameleon? This particular plush chameleon will be able to produce glowing light which gently changes colors to help children wind down at bedtime. The two chameleon’s eyes, its back, and tail will emit soft red, green, and blue shades of light which will then transition in a subtle manner so that a child can be comforted at bedtime. To further ease the journey into dreamland, there is the option to have the light be accompanied by the soothing sounds of chirping birds as well as leaves rustling in the wind in a rain forest or tropical music with softly strumming string instruments. There is an integrated 45-minute timer that automatically turns the light and music off, while the Glowing Plush Bedtime Chameleon doubles up as a cozy playmate during the daytime.